The finding that working memory training can increase fluid intelligence triggered a great number of cognitive training studies, the results of which have been fiercely debated among experts. The finding also prompted a surge of commercial versions of these working memory training programs. 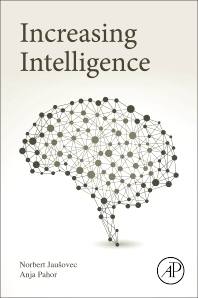 Increasing Intelligence overviews contemporary approaches and techniques designed to increase general cognitive ability in healthy individuals. The book covers behavioral training and different electrical stimulation methods such as TMS, tDCS, tACS, and tRNS, along with alternative approaches ranging from neurofeedback to cognitive-enhancing drugs. It describes crucial brain features that underlie intelligent behavior and discusses theoretical and technical shortcomings of the reported studies, then goes on to suggest avenues for future research and inquiry. 1.2. Can we boost intelligence? 3.7. Video games: with fun to more intelligent brains? 6.1. Why become more intelligent? Norbert Jaušovec obtained a doctorate degree in psychology in 1985 at the University of Ljubljana, Slovenia. He started his professional career as a school psychologist. He has been employed at the University of Maribor since 1984 (until 2007 at the Faculty of Education and at the Faculty of Arts since then). In 1996, Dr. Jaušovec was elected full professor for the domain of educational psychology. His scientific research deals with the cognitive processes that are involved in expert problem solving. The goal of his research is to relate different physiological measures such as heart rate and EEG to differences in problem solving between gifted and average-ability individuals. He also aims to transform theoretical findings into knowledge that can be used to improve students’ problem solving ability. Besides universities in Slovenia, Dr. Jaušovec has lectured at a number of distinguished universities in Europe and was, or still is, a member of the editorial board of the following journals: The Curriculum Journal (Taylor and Francis), BMC neuroscience (London: BioMed Central), and The Open Neuroimaging Journal (Hilversum: Bentham Science). As first author or co-author, Dr. Jaušovec has published a wide variety of works, including three scientific monographs, two professional units and one textbook. He has published several scientific and professional articles which have more than 2000 citations. Anja Pahor obtained a Bachelor of Science degree in Psychology and Cognitive Neuroscience at The University of Nottingham and a Master of Science degree in Brain and Cognitive Sciences at The University of Amsterdam. Her main research interests involve understanding the neural basis of working memory and intelligence with the help of neuroimaging methods and noninvasive brain stimulation. Professor Norbert Jaušovec is her PhD supervisor at The University of Maribor and she is currently in the process of obtaining a doctorate. Part of her PhD research was conducted at the Department of Psychology at The University of York. The results of her studies have been published in several peer-reviewed journals.